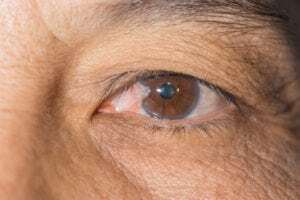 A pterygium (pronounced “te-RI-jee-um”) is a non-cancerous growth of the clear, thin tissue that covers the white part of the eye (conjunctiva). Commonly known as “surfer’s eye” (and “carnocidad,” in Spanish), pterygia typically occur towards the nose and may involve one or both eyes. Although its cause is unknown, pterygium is more common in people who spend a lot of time outdoors. Risk factors include exposure to sunny, dusty, sandy, or windblown areas. Farmers, fishermen, and people living near the equator are more often affected than the average person. Pterygium is rare in children. The primary symptoms of a pterygium are minor irritation and redness. It will usually present as a painless area of elevated white tissue, with blood vessels on the inner or outer edge of the cornea. A physical examination of the eyes and eyelids confirms the diagnosis. The pterygium is carefully measured and recorded in order to determine if it is growing. Special tests are usually not necessary. No treatment is required unless the pterygium begins to block vision or is documented to be growing. In these instances, it should be removed with surgery. Wearing protective glasses and a hat with a brim can prevent progression and keep the pterygium from returning after removal. Most pterygia cause no problems and do not need treatment unless they are symptomatic. Irritation and redness can often be alleviated by wearing sunglasses and using artificial tears. If a pterygium needs to be removed, results are usually good. A pterygium can return after surgery. Sometimes pterygia return and grow more rapidly than before they were removed. While we have many sophisticated techniques and medication to help prevent recurrence, some studies quote recurrence rates as high as 15%. Call to schedule an appointment with your ophthalmologist if you have had a pterygium in the past and your symptoms have returned.